Feeding beef calves on higher rates of milk replacer is known to improve weight gain in the pre-weaning period, but new results show benefits right through to slaughter on an intensive system. In the studies at Harper Adams University, calves fed on higher rates of milk replacer as pre-weaned calves performed better with higher daily weight gains through to slaughter than calves initially fed lower rates of milk replacer. Calculations also suggest the increased carcase value covered any increase in feed costs. Simon Marsh, principal lecturer and beef specialist at Harper Adams, who oversaw the study, says: “There has been considerable interest in feeding elevated levels of milk replacer to dairy replacements. Mr Marsh explains that in the study, 34 British Blue cross Holstein calves had been reared on either 750g/day or 900g/day of milk replacer. Both groups were fed ad-lib early weaning concentrates. Milk feed rates were gradually reduced through to weaning at 42 days. At weaning, calves fed on the elevated rate of milk replacer had averaged 0.91kg/day daily liveweight gain (DLWG) compared to 0.73kg/day achieved by calves on the lower rate. At 12 weeks they had gained 5.6kg more and scored higher on wither height, hip height and last rib girth, showing they were bigger framed. “Concentrate intakes were the same between the groups, although we expected calves fed higher rates of replacer would eat less concentrates,” Mr Marsh says. 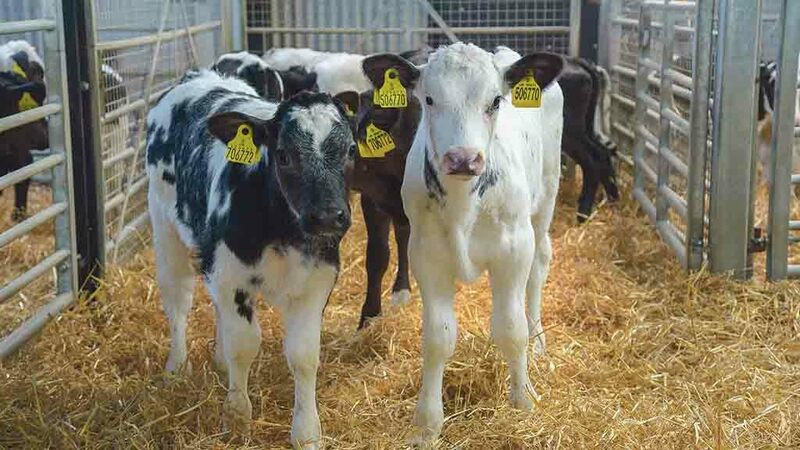 “This led to feed costs being 5p/kg gain higher on the elevated feed rates, but the number of calves requiring medical treatments was significantly lower. The question then remained about whether having larger, healthier, better-framed calves at weaning would translate into higher valued animals at slaughter. The calves were then taken through to slaughter on an intensive cereal beef system and their performance monitored. “From 12 weeks old, the cattle were fed a barley-based 14 per cent crude protein, 37 per cent starch concentrate ad-lib with straw available ad-lib as well,” Mr Marsh says. “Cattle were selected for slaughter at a target fat class of 3. Mr Marsh says bulls fed on the higher level of milk replacer recorded slightly lower fat classifications and could possibly have been slaughtered older at a similar age to the bulls fed on the lower rate of milk replacer. This would have meant they would have achieved significantly heavier carcase weights. “When we look at the financial impact, calves fed 900g milk replacer recorded an extra £33 carcase value, easily recovering the £13 extra pre-weaning feed costs,” he says.